This one's for the homeowners out there. Or I suppose also apartment renters that don't mind losing their security deposits. Andersen Windows has launched a new product and they'd like to give a few away to Bloggery readers. Andersen Windows, has a very cool new device that limits how far up a double hung window can go, limiting it to less than four inches. For kids in the house, and especially as windows are more open in spring and summer, I thought it might of interest to your readers. Boston is an extremely strong Andersen market, and it is likely that many of your readers would have Andersen. The device works on 400 Series, 200 Series and A-Series product lines from Andersen. Each kit contains right and left upper sash devices with full installation instructions. The devices are to be installed on both sides of the upper sash, limiting the opening of the lower sash to less than 4 inches. Release of the device allows the sash to fully open for maximum ventilation or if escape and rescue is necessary. 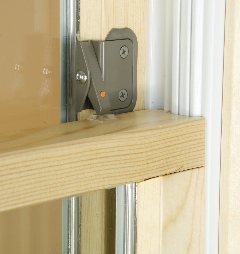 The devices automatically reset once the lower sash is returned to the closed position and will therefore stop at a less then 4 inch dimension when the sash is opened again. Probably a good idea for folks with mischievous kids. If you're interested in entering the contest, email me with subject heading "Andersen Windows". As of right now, one winner will be chosen to receive devices for two windows. They've offered me a set as well, but I'm going to see if I can give them away as well - so there may be two winners. Deadline to enter is Friday 5/20 at 10pm EST. Click (here) to visit the Andersen website. 0 Response to "Contest: Andersen Window Lock Giveaway"